Fig 1: Distribution of Ebola cases. The Ebola 2014 outbreak that began in March 2014, has been one of the toughest outbreak that is successfully restrained by an international effort. As of on 11 Feb 2015, a total of 22894 cases have been reported with 9177 deaths (case fatality ratio= 40.08%). Fig 1 shows the distribution of cases in intensely affected regions. A total of 65 new confirmed cases were reported in Guinea, 3 in Liberia, and 76 in Sierra Leone in early February. A very detailed data on the current situation has been reported by the WHO (Link). The statistics looks quite impressive in comparison with the numbers during the active outbreak. However, new cases are a worry and efforts are on to pin it down. Th last traces of cases are really hard to wipe out in any outbreak. The complete control of EBOV outbreak will be possible with rapid diagnosis and effective measures post diagnosis. I have already talked about Ebola vaccination and treatment strategies under evaluation in my previous posts. Routine diagnostics by PCR or other molecular methods require its own time, which is a significant window to the problem (Link). Point of care testing have been an attractive candidate for development. One of the first tests to have brought in the hope was RPA (Recombinase Polymerase Amplification) method, a technology developed by TwistDx Ltd. 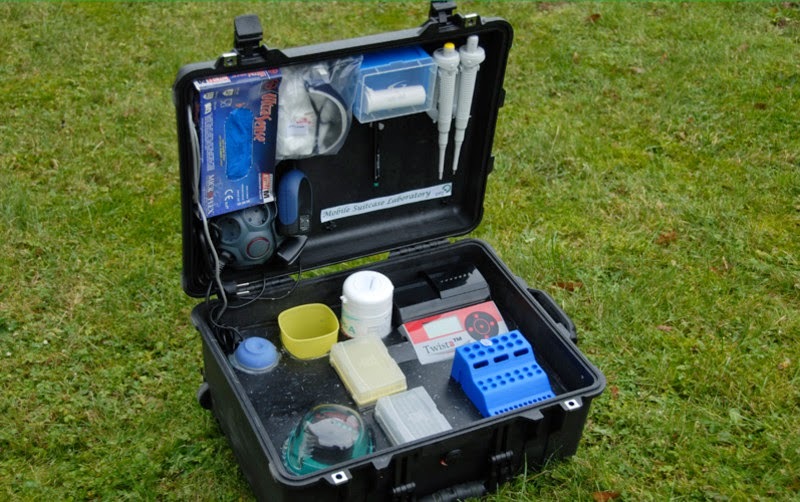 The entire diagnostic kit could be packed into a suit case, operated by an integrated solar panel and a power pack. 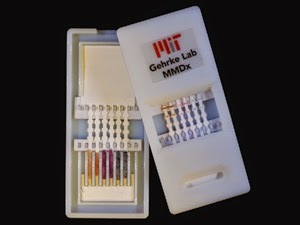 Famously dubbed as Diagnostics-in-a-Suitcase, results can be produced in 15 min. The technique is an Isothermal amplification method. Isothermal amplification makes use of polymerase that can both make and break DNA strands without having to cycle between temperatures. In RPA a Staphylococcal Sau polymerase does the work. By combining it with probes that can fluoresce upon amplification the reaction can be carried in a rapid and reliable way. One of the other famous Isothermal amplification method include- LAMP assay. More recently a silver nanoparticle based lateral flow test has been developed. Use of nanoparticles in diagnostic is fairly a recent concept and has been well researched upon in multiple context. For example Silver particles have been used in a technique called Au-nanoprobe hybridisation, which can be used for SNP detection. That is just an example. An entire range of tests including genomics, proteomics, MEF (Metal enhanced Fluorescence) methods have been developed based on silver nanoparticles. In a new method published in Lab on a chip, The test strip contains a paper strip with antibodies attached to silver nanoparticles of varying sizes. These nanoparticles have a property that they will produce different colors when presented in different sizes. When patients serum sample diffuses via lateral flow antibody attached silver particles flow along producing a distinctive color line which can be visualized. The test has been optimized to detect Yellow fever, Ebola and dengue. The strip measuring around 8×3 cm takes 10 minutes at a cost of 2$ per test. This is one of the finest examples of next generation Laboratory detection technology. 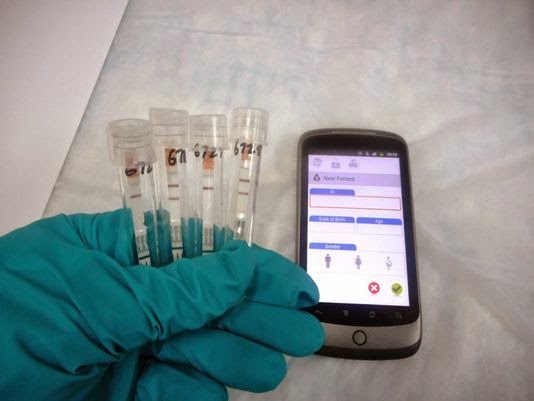 It would be interesting to see and compare the efficiency of these rapid tests in field and how well could they contribute to the control of current Ebola outbreak. Even if the performance is slightly low these tests have great potential as a screening toolkit. Measles outbreak: Sue the Anti Vax group. Infectious disease represents a much lesser threat than what it used to be just a few decades ago. About half a century ago, cases such as Polio or Small pox was just so common. The technique of vaccination has brought in so much relief to the world population, that some of the nightmare infections, is now a matter of history. One of the classical example is small pox. Polio is the next obvious contender of the list and a polio free world would have been a reality already, if it is not for a bunch of idiots calling themselves "Anti-vaccine group". There is a bigger worry that has now hit the public, a proof of concept that the public health has been endangered by this group by acting intentionally on anti-scientific grounds. Yes you are right- I'm talking about "Measles outbreak". US which was declared as "Measles free" in 2000 is now seeing an upsurge of infections which is correlated with lack of vaccination coverage. The official evidence of what I just talked about. 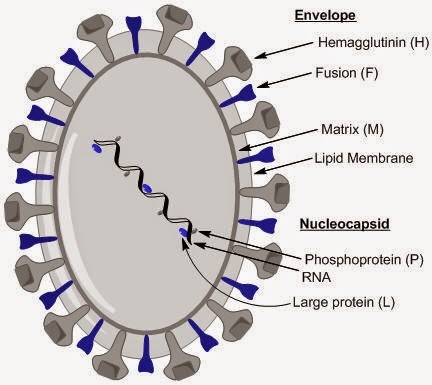 Measles virus (MV) is an enveloped single-stranded, negative-sense, RNA virus of the genus Morbillivirus within the family Paramyxoviridae. Humans are the natural hosts of the virus with no known animal reservoirs thus making them an ideal case for eradication. The structure of MV is shown in Fig 1. The most important part of the structure is its glycoproteins- (i)F (fusion) protein, which helps in fusion of virus and host cell membranes, viral penetration, and haemolysis (ii) H (haemagglutinin) protein, which is responsible for binding of virus to the cells. As of now there are 8 clades of measles (designated A–H) and subtypes are designed with numerals. The strains are designated as A2, B1 etc. There are a total of 23 subtypes known. The receptor in human cell for the binding of H protein are CD46 and CD150 (SLAM; signalling lymphocyte activation molecule) CD46 is a complement regulatory molecule expressed on all nucleated cells in humans. SLAM is expressed on activated T and B lymphocytes and antigen-presenting cells. Antibodies against the H protein are neutralizing antibodies. In brief, this is what happens in the measles infection. The virus is inhaled and infects the epithelial cells in nasal tract. The virus replication continues and reaches the lymph nodes. From there there is a primary viremia. Subsequently, it spreads into multiple tissues and secondary viremia ensues, with infection established in skin and reticulo-endothelial tissues. The rashes developed at this time is referred to as the Koplik's spots. The infection subsides with the appearance of antibodies and immunity is protective for lifetime. There is some clue that this traditional thought is not right and new challenging works have been published. As per the model published by Leonard etal the virus is carried primarily by lymphatic immune cells and are directly carried to the reticuloendothelial system where it further replicates. It doesn't replicate in nasal epithelial cells. Despite being an infection passed through the airway, the infection is largely considered as an infection of immune system. This is consistent with the fact that the receptors for virus are predominantly seen in immune cells. Subacute sclerosing panencephalitis (SSPE) is a progressive, brain disorder which occurs post measles infection and seen only in people who have not been vaccinated. The average number of cases reported is less than 15 cases per million. The neurotropism of the virus is not well understood, though studies have been performed in hamster models. One of the most important factors that determine the mathematical predictions and ability of outbreak, is based on a measure called as R0. R0, is an epidemiological parameter in infectious disease, which basically means basic reproduction number/ rate. It is the number of people who transmit the infection from one sick person, on average, in an outbreak, in other word "contagiousness". It should be noted that R0 represents the potential for transmission in a totally susceptible population and hence does not depend on the level of susceptibility. That means R0 will not change for a given infectious disease despite vaccination. But by vaccinating the "Susceptible population" number can be reduced which leads to decline in number of infected. In other words "Herd immunity". 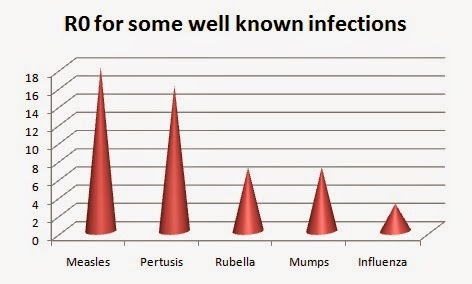 The R0 for MV is one of the highest in infectious diseases. For comparison I have shown the R0 for some common viral infections. The R0 for MV is 12- 18. That means Every individual case can infect upto a maximum of 18 fresh new susceptible cases. That means, you need to vaccinate at least 80% of the population to achieve a good cover. The best performing vaccine is a triple vaccine called as MMR. It contains measles, mumps, and rubella (German measles). 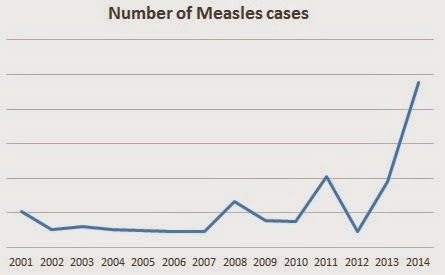 The measles vaccination program has been a highly successful camp at least in the US. The country was declared as Measles free and cases would pop up as imported cases. However, the vaccine coverage has decreased slowly. It has been estimated that from a loss of coverage of less than 2% in 2000 the current coverage has dropped to more than 80%. As given in nature news "And by 2013, the proportion of eligible children who had been vaccinated had dropped by 2% since 2004, to 91%". A rough idea of the trend can be inferred from the Fig 3, cases per year in US based on CDC data. What leads the parents to take a decision of not vaccinating the child? The discredited study of Wakefield published in lancet, 1998 had made a statement that vaccination causes autism!! Of course the study was biased and probably intentionally fabricated to produce a result making headlines. An excellent post on the whole story is posted in the Huffington post (Link). Ever since this has been studied in great deal and shown not to be the case. However, it has been hard to convince people. There is a great post explaining why it is difficult to debunk certain facts (Link). The whole scenario has reached a tipping point. The current upsurge of cases has been attributed to parents who have decided not to vaccinate. Interestingly famous peoples involved in anti vaccine campaign have suddenly backed off. In a news feed by BMJ reads so "The instructor of a first year health course at Queen’s University in Kingston, Ontario, has taken a leave of absence after local media reported that she was teaching antivaccine material .." I wonder how could the person have become a professor in first place. Moreover, parents of infected child have now come up strongly against the people who don't consider vaccination. The Disneyland outbreak has finally provided a strong case to the public they are being led on the wrong pathway. People have questioned that why has this come so late. Let me quickly consider an example. The following quote of incompetence by an anti-vaccine person, “I’m a big fan of what’s called paleo-nutrition, so our children eat foods that our ancestors have been eating for millions of years, that’s the best way to protect.” (Source). What the person forgot is our ancestors had suffered enough of measles and vaccination protected us. The fact that we have been vaccinated for so many infections and protected from it has led us to forget the times when this luxury was not available. I think it is time public rise from the mistakes and correct themselves, and not punish the children for whom health is a basic human right. Tuberculosis is a topic that I have talked about a longtime ago. It a topic that is very hard to be kept track of. With an encouraging drug approval in the TB pipeline, after a staggering 40 years, there is a sudden increase in interest in new drugs and combination of drugs all aimed at reducing the current longterm treatment strategy. In my earlier post, I talked about Anti TB drugs in some new combinations. In the post, I mentioned in passing a compound code named- OPC-67683. The compound was then under development by Otsuka Pharmaceutical Co. Ltd. The drug has now come sufficiently far in research to claim equivalence with drugs such as Bedaquiline. The drug is now known as Delamanid. The drug is a member of nitroimidazole class which attacks Mycolic acid synthesis pathway. The drug has received much attention after its approval from European medicines agency (EMA), Japan and Korea for the treatment of MDR-TB. Like other classic Anti- Mycobacterial's it is a prod drug. It is activated by the enzyme deazaflavin dependent nitroreductase. Currently it is seen as a strong candidate for Anti-TB and planned to be used in combination therapy. One of the strong contenders for combination is bedaquiline. With a huge interest of research in developing new Anti-TB drugs are making its appearance in clinical pipeline. As I have discussed previously (Link), the problem in treating TB is the period required to treat rather than the organism. Patients refuse to comply for a very long time. New set of drugs in pipeline are aggressive drugs and supposed to reduce treatment duration. However, all the new drugs are reserved for treating MDR TB. This because like any other drug, over use of this drug will lead to resistance and we will be back in square zero. This has led to some debates. On one hand you have a drug that can cure faster, thereby reducing the treatment time and thus avoiding emergence of resistance by eliminating problems with patient compliance. On the other there is a risk of resistance inducement owing to widespread use. I found some serious flaws in this arguments. The studies are showing that Anti TB drugs have better outcomes when given for 6 months in comparison with a 2 month regimen. So it is still a good idea to have them as drugs for MDR's which is difficult to otherwise treat. In my previous post, I had written about an Enterovirus outbreak, that has found some great attention from the scientific communities. It seems that infection outbreaks, receives media attention far more than it should. Recently, the media has caught with another outbreak- Influenza in India. 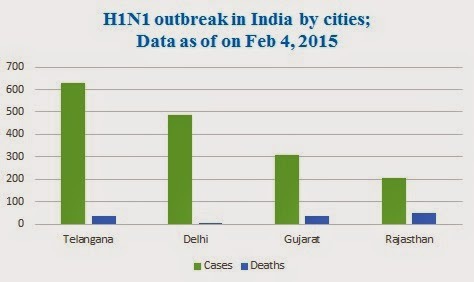 There is supposedly emergence of H1N1 infections in Indian population. However, the media has to falied to note that this is not an abrupt case. In a NCDC news letter published in April 2013 (Link), In India, from May 2009 to Feb 2013, a total of 24,5239 persons were tested at NCDC for H1N1 and 54,329 were found positive, with 3362 deaths. H1N1 or swine flu is known for its pandemic appearance in 2009. This was the second time the world had seen the H1N1 pandemic. The first one in 1918 had left an everlasting fear with the scope of outbreak and deaths. To much of the relief the 2009 pandemic was mild with a much lower mortality ratio. Subsequent analysis and estimates agreed that there was globally less than 3,00,000 deaths in the whole world and most these deaths occurred in Africa and Southeast Asia. Subsequently it had been argued that a case fatality rate of 2–3% was not as grave as it was projected to be and that it was mainly a problem in immune compromised status. In 2013, H7N9 was all over the news as potentially a new strain. However, a rapid health care commitment and international attention had put excellent breaks on the infection. Subsequently there have been official report pop-ups of a variety of strains in distinct geographical areas of a variety of influenza strains but none with news making potential. Fig 1: Influenza Outbreak cases and Deaths. The lack of surveillance program and clear official reports have hindered my ability to clarify the current situation as to the numbers. As the best I could make from press releases, as of on Feb 4, 2015 the estimates are from a total cases of 2038 with 191 deaths (9.37% case fatality rate). The figures are depicted in Fig 1. I have shown only the states where the numbers seem to be high. Other cities have reported cases as can be seen from news reports. It is not clear what the situation represents. There are many questions as to why there is an apparent rise in Influenza cases. One of the suggestion is that it is probably due to an unusual cold temperatures this year. The idea looks quite promising and may explain the increase in number of cases*. Without a clear genetic analysis of at least few strains from this outbreak, it is hard to rule out new mutations. The mortality rate is not a worry (as you can see from the Fig 1) but there is a clear alarm bell set of in the country. Unlike the practice in developed countries, India don't practice Influenza vaccination as a serious issue. Moreover, availability of Tamiflu (Oseltamavir) is considered as a sufficient cover. Recently there have been huge sets of controversy discussed, regarding the Tamiflu stockpiling for future use. Tamiflu can reduce the severity of influenza in grave cases, but are not effective in infection elimination. I wish to see a paper as soon as possible from NIV and NCDC as early as possible identifying the genetic epidemiology which can give a lot of insight and aid in further decisions. The data availability on the issue is absolutely zero as you can see below.. No reference papers to cite !! *Update: I have previously posted that I don't buy the point that unusual cold temperatures can give flu some advantage in spread. However, I read an article in sciencedaily, which sufficiently is a proof of concept. I have rectified the point.